I have assigned the Autumn Leaves quilt block to the Intermediate skill level -- not because it has difficult pieces, but because there are so many pieces in the block -- 53 to be precise. The only patches used are squares, rectangles and half square triangles. By taking your time, you can create this lovely seven patch block in no time, as long as you take care to be precise in sewing an accurate quarter inch seam allowance. The good news is that you will make a larger quilt block due to the design using a 7 grid, and so this makes a lovely 14" quilt block. However, I have also given instructions for making a 7" quilt block as well. 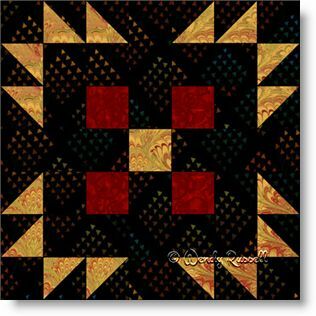 The sample quilts illustrated give you some idea of the versatility of this block. And, just to deviate from the norm, I used a dark fabric for the background for a change. (Most quilters prefer to use lighter fabrics for the background). I hope you enjoy experimenting with this lovely block.